Google seems to be indexing Bing search results. 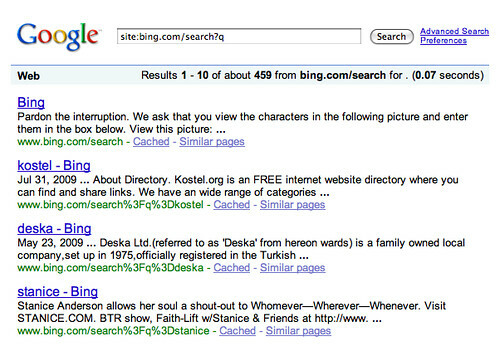 Take a look at this query and you will see some of the Google search results leading to Bing search results. So I decided to check to see if Yahoo, Ask.com or even Bing themselves were doing the same. It seems like Ask.com is also doing this, but Yahoo and Bing are not indexing Bing results. Google doesn't like to see search results in search results so this is not common to see in Google. Previous story: Can A/B Testing Cause An SEO Problem?